If you’re a fan of large-screened phablet devices and are thinking of adding a new smartphone to your holiday wish list then there are two phones making waves right now that you might want to consider. Today we’re looking at the Nokia Lumia 1520 vs. Sony Xperia Z Ultra, with specs to impress. The Sony Xperia Z Ultra has a whopping 6.4-inch display and released a few months ago. The new Nokia phablet was officially unveiled yesterday and the Lumia 1520 release is set for sometime this quarter, in time for the lucrative holiday season. We’ll highlight the main specs for each device. The Nokia Lumia 1520 is powered by a 2.2GHz Qualcomm Snapdragon 800 quad-core processor with Adreno 330 graphics and coincidentally the Xperia Z Ultra has exactly the same set-up. The Lumia 1520 has a 6-inch IPS LCD display with Full HD resolution and 367 ppi while the Xperia Z Ultra has a 6.4-inch display, also with Full HD resolution and 344 ppi. There’s 2GB of RAM and 32GB of internal storage for the Lumia 1520, expandable via microSD to 64GB. The Xperia Z Ultra has 2GB of RAM with 16GB of internal storage, but is also expandable to 64GB. A 20-megapixel rear camera with Carl Zeiss optics, optical image stabilization, autofocus and dual-LED flash graces the Lumia 1520. It features PureView technology and1080p video capture and there’s also a 1.2-megapixel front-facing camera at 720p. On the other hand the Xperia Z Ultra has an 8-megapixel rear camera with autofocus, image stabilization, HDR, and 1080p video capture, as well as a 2-megapixel front-facing camera at 1080p. The Lumia 1520 packs a 3400 mAh battery while the Xperia Z Ultra has a 3050 mAh battery. The Lumia 1520 is a Windows Phone 8 handset. The Xperia Z Ultra runs the Android 4.2 Jelly Bean operating system. The Nokia Lumia 1520 measures 162.8mm x 85.4mm x 8.7mm and weighs 209g. The Xperia Z Ultra measures 179.4mm x 92.2mm x 6.4mm and weighs in at 212g. The Lumia 1520 will be available in black, white, red or yellow color options whereas the Xperia Z Ultra comes in black, white or purple. As you can see from the above, both of these handsets have a very impressive array of specs, although we should point out that the Xperia Z Ultra is also dust and water-proof. There are more specs and an abundance of features for each that we cannot detail here, but both phones have a lot to offer. If you have an open mind about using an Android or Windows Phone handset then this could be a tough decision, but aspects such as preference of design will also come into play. To help you out a bit more we’ve embedded a short video below that shows both handsets together and highlights some of the differences. 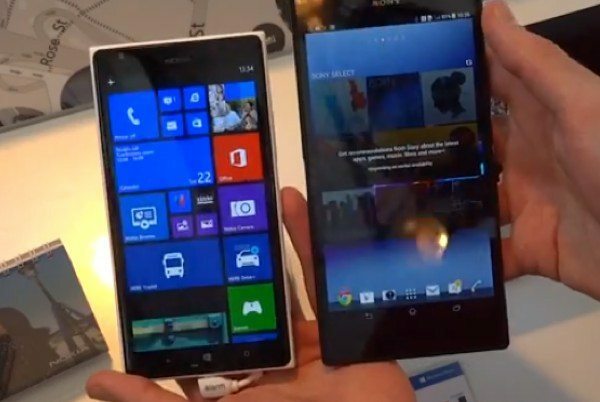 Ultimately the Nokia Lumia 1520 and Sony Xperia Z Ultra are both notable devices and have a lot to recommend them. Are you likely to favor the Xperia Z Ultra for its Android experience? Maybe you’re tempted to try your first Windows Phone handset with the Nokia Lumia 1520? Send your comments to let us know.